After years of great use and comfort many soft side bed owners may want to do some maintenance and purchase replacement parts. 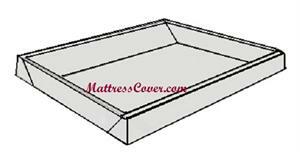 If you are looking to replace the foam rails in your softside mattress these foam rails are a great selection and are made with quality high density foam. The rails that we stock are 7" in height. For all other sizes please call. To get the correct foam rails for your bed please measure the height of your rail on the outside which is the straight side. We stock Twin, Full, Queen, Eastern king & California King. 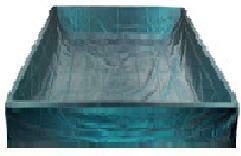 For other replacement parts browse to find all needed soft side waterbed replacement parts. Organic Cotton PillowTop is Plush, Super Soft & very breathable. Cover can also unzip off with out draining your bed. Make your softside mattress feel & look like new again. Available in Eastern King, Cal king, Queen, full, Twin & Twin XL. 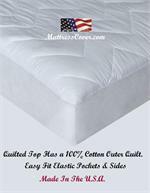 This cover is made with a very high end organic cotton outer material which increases airflow through your mattress. It's not overly thick and the top part of the cover can unzip off from the bottom. Softside Euro top covers are our most plush covers & designed to provide a sleep surface that is super soft and very breathable. The bamboo outer material is high-end & very luxurious. Best mattress zip covers in the market for your softside watebed. This luxurious Bamboo zipper cover has a quilted smooth top & it's manufactured with a very high-end Bamboo outer quilt. The bamboo will increase air flow through the surface of your mattress very much like cotton. Very comfortable. Made in the U.S.A.